Mexico, like many other developed and developing nations, has a major health battle on its hands. Simply put, most people here are overweight. A combination of too many calories and too little exercise places millions of Mexicans at serious health risk, concludes a recent study of the nation’s population. 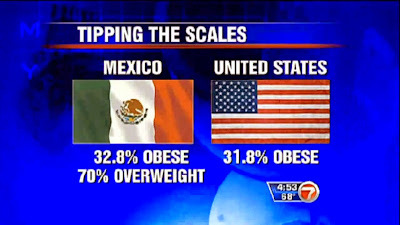 A 2010 study of obesity commissioned by the Mexican government concluded that 70% of the country’s population is overweight. Some four million children suffer from clinical obesity, which is defined as a BMI (body mass index) of over 30. According to the federal study, Yucatán state has Mexico's highest obesity rate among children age 5 to 11, and the fifth highest among adolescents 12 to 19. In the younger group 36.3% of children are overweight, and in the latter group 38.9%. The study was reported October 3 by El Diario de la Yucatán, a major Mérida daily. The problem is aggravated by poverty. The limited incomes on which many families must subsist interferes with maintenance of a healthy diet, and promotes the consumption of fast food and junk food, says Mauricio Hernández, undersecretary of Mexico’s agency for disease prevention. Those foods are generally cheaper and are readily available on the street, he noted. Roberto Marmolejo, editor of Balance magazine, says that the problem is also one of lack of education about how to select healthy foods, as well as the importance of regular exercise. In 2010 Mexico passed an anti-obesity law which was particularly aimed at young people. It prohibits the sale of foods with very low nutritional value, particularly ones high in fats, salt and sugar. The World Health Organization says that Mexico’s battle with obesity could cost the country $15 billion USD over the next decade, in the form of treatment for diseases such as diabetes, heart disease and hypertension. © MGR 2011-2014. All rights reserved. This article may be cited or briefly quoted with proper attribution or a hyperlink, but not reproduced without permission.